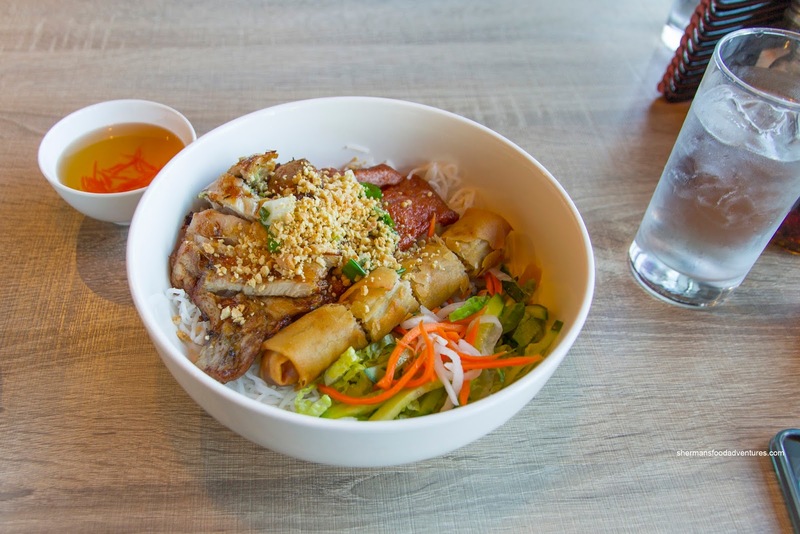 As much as there are a wide array of Vietnamese restaurants in the GVRD, there are some dead spots of sorts. Referring to Burnaby, I can attest to the lack of choices in the Burnaby North area. Yes, there is the token Pho 101, but that is about it. One would have to travel down Hastings closer to Boundary to find more options. 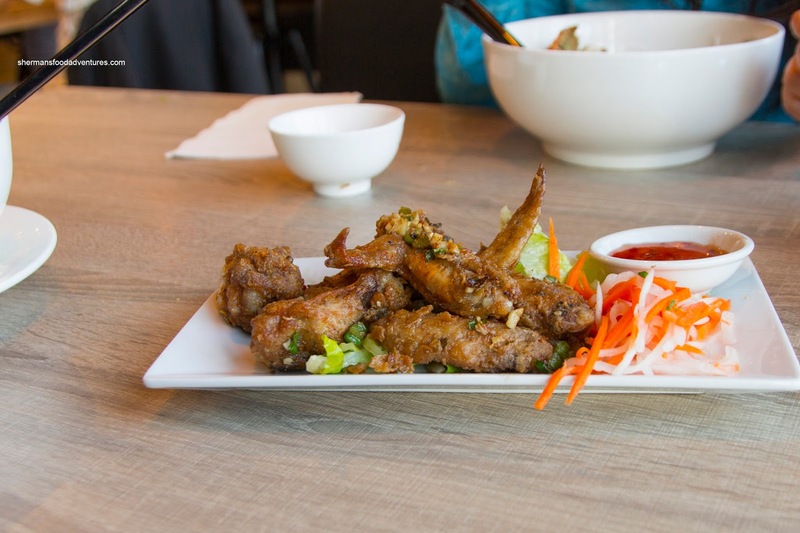 Another black hole of Vietnamese cuisine resides in the Brentwood area where up until recently, there were no choices. Enter Pho D'Lite tucked away in the Whole Foods complex. I think they have the market cornered for the time being! Of course, Viv and I decided to check it out. I spotted the Butter Garlic Wings on the menu and of course had to do my "is it as good as Phnom Penh routine". Although they were flavourful and nicely spiced with hits of garlic, the skin was soft and fatty. There was no crispiness at all. Furthermore, there was a considerable amount of grease. 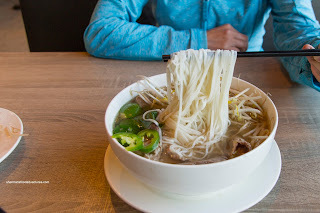 We found the Pho Dac Biet to be well-portioned with a decent amount of thinly sliced meats. They were tender while the broth was clean and lightly seasoned. The most dominant flavour was the sweetness of daikon. We also got a Vermicelli Bowl with spring roll, lemongrass chicken and sausage. Considering that one item costs $10.00 whereas 3 costs $13.00, it seemed to us that it was worth the extra $3.00. This was a fairly decent dish where the spring roll was crunchy with a moist filling. The chicken was not succulent per se, but it was hardly dry either. Loved that the skin was well-rendered. There was no absence of seasoning either. On another visit, I had the Bun Bo Hue and I found the broth to be rather one-note. 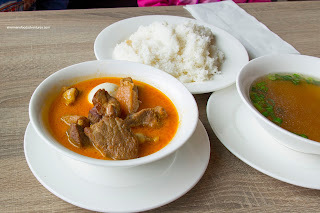 There was definitely spiciness, but not much in the way of aromatics. I would've liked to have some seafoodiness to add another layer of flavour. Although it was missing both the pork knuckle and blood, the meats were decently tender and well-portioned. 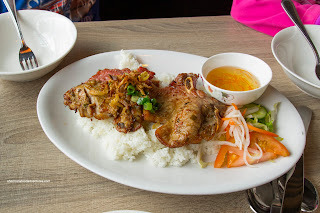 We really enjoyed the Pork Belly with rice as the sauce was aromatic from the coconut milk and ever-so-slightly spicy with a background sweetness. The meat was really tender and moist. The kiddies shared the Lemongrass Chicken, Pork Chop and Sausage on Rice. Texturally, the chicken was still moist despite a slightly dry exterior. We found it drier than the first time. It still tasted quite aromatic though. As much as the pork chop seemed thin and dry, it was fairly tender and once again, well-marinated. The pork sausage had a nice rebound and tasted rather sweet. 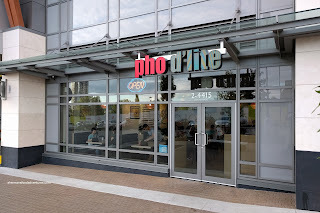 Overall, the 2 visits to Pho D'Lite were pleasant enough with decent eats. 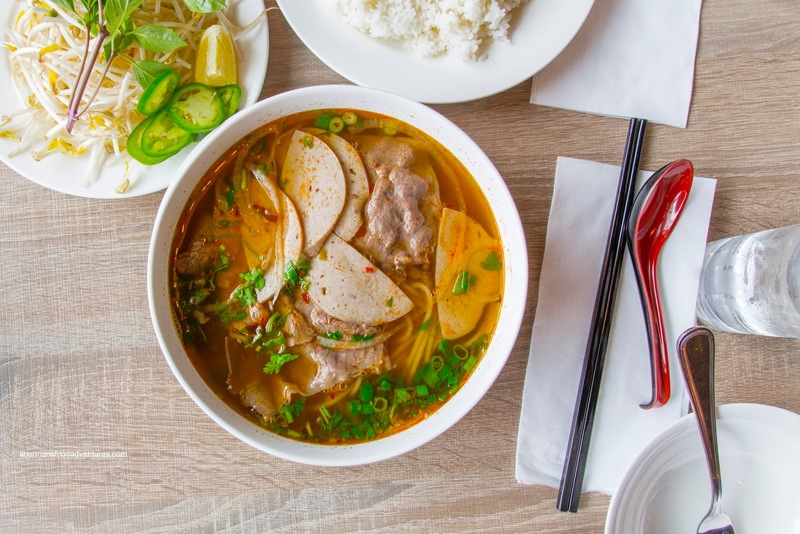 Sure, it won't be confused for the best Vietnamese in town, but there is nothing else like it in the neighbourhood.